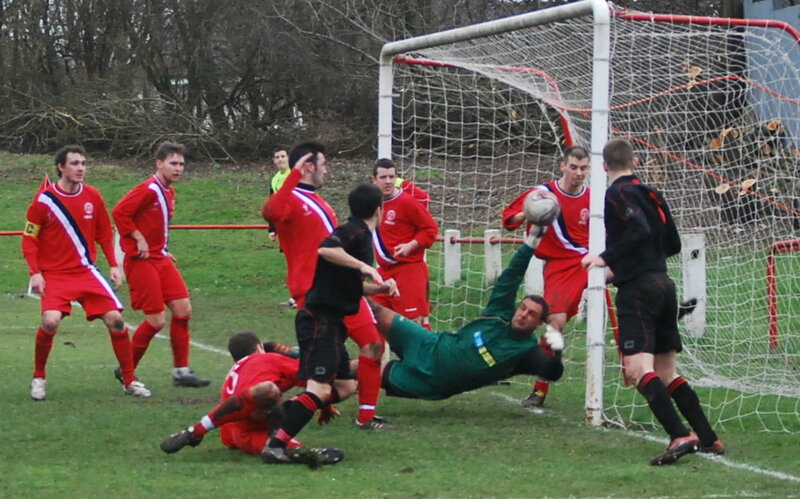 A late close range header from substitute Chris Faulds earned a share of the points for ten man Thorniewood after the hosts had survived a second half pummelling from Glenafton who took the lead through a 25 yard stunning strike from Gareth Armstrong but were also denied by the woodwork on at least three occasions. In what proved to be a scrappy first half clear cut chances were thin on the Robertson Park ground. The visitors began brightly enough and with four minutes gone Gareth Campbell from the corner of the penalty area picked out Gareth Armstrong on the outskirts of the six yard box but his attempt to prod the ball home was thwarted by keeper Jon Connolly. Ten more minutes passed before his counterpart Ally Semple was called into action of any note. A slick passing move by Thorniewood ended with Barry McGowan releasing Matthew Bennett through on Semple and although the keeper came out on top he was left stranded to look on as the ball rebounded across the face of the goal and fell to Steven Maguire but the striker fired wide of the wide target. As the half drew to a close Glenafton gained the upper hand and forced a series of corner kicks one of which was earned when a John Paul Boyle flick into the box was headed onto his own crossbar by defender Steven Low, with Connolly glad to see the ball bounce wide. The visitors continued to push for the opener and with a minute of the half remaining came close to achieving that goal. Richie McKillen fed Gus Cochrane down the left flank and the youngster’s cross saw Paul McKenzie out jump three ‘Wood defenders and head the ball on for Armstrong to gather and blast the ball goalward from 10 yards out only for Connolly to pull off a stunning save. The two adversaries enjoyed a sporting handshake of mutual admiration before the resultant corner was kicked. The hosts were first to threaten and in the opening minute substitute Steven Mullen caused a stir in the Glens’ box, however the Craigs , Menzies and Potter, teamed up to block his path to goal. A minute later at the other end McKillen towered above his markers to head the ball from Campbell’s corner into the six yard box where Boyle was first to react but his header skimmed off the top of the bar. Five minutes later Boyle and Armstrong joined forces to set up McKenzie and although his snap shot from 12 yards beat Connolly the ball struck the inside of the post allowing the keeper the split second needed to smother it safely to his chest. A minute after that, on 53 minutes, Armstrong headed on and Boyle beat the offside trap set by Low and Jamie Brophy, while the former lumbered the latter gave chase and did enough to put the Glens man off his stride and the chance was gone. Before the second half was ten minutes old the woodwork came to ‘Wood’s rescue again. Campbell fired in a vicious corner kick that left Connolly swinging from his cross bar but neither Campbell or Paul Murphy could connect and the ball crashed off the inside of the post and the rebound cleared. Thorniewood fashioned some respite and forced a corner that came to nothing. 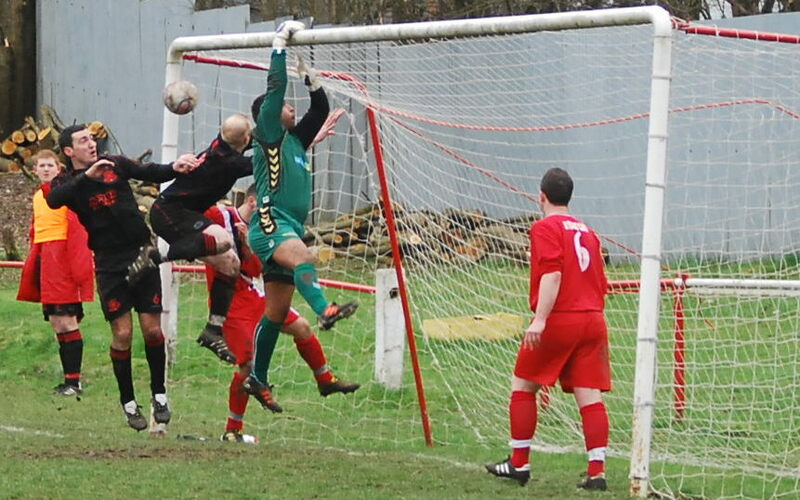 Back came Glenafton and Low, who was finding Boyle a handful , conceded another free kick which was lofted into the box and won by Robbie Henderson but gathered safely by Connolly. Back upfield and a Thorniewood corner caused more of a stir than had its predecessor. However, the ball didn’t fall kindly for Bennett and his shot was blocked and mopped up by Menzies who set livewire Boyle off on his merry way leaving one defender in his wake before threading the ball between two others into the box for Campbell to chase, but the alert Connolly raced from his line to dive at the attacker’s feet and gather the ball. On 65 minutes the visitors’ pressure paid off with an exquisite goal. Potter broke down a Thorniewood move in the centre circle and laid the ball off to Cochrane who took a touch before hitting an inch perfect pass to Boyle who squared it to Gareth Armstrong and BANG! – the Glens ‘ top goal scorer thundered the ball from 25 yards out past the flying Connolly at full stretch and into the top right hand corner of the keeper’s net. The leap of joy in celebration was equally impressive. Seven minutes later Connolly came to the rescue with a miraculous double save. Henderson’s header from a Campbell corner seemed to be sailing into the corner of the net before the keeper pushed it onto the post and then pulled himself back off the ground and outstretch an arm to claw the ball off the line after Boyle had tried to bury the rebound; the Glens’ striker’s second bite at the cherry was blocked by a bunch of red shirted defenders. A minute later ‘Wood substitute Chris Faulds’ long pass back from deep in the Glens’ half caught out his team mates and Armstrong nicked the ball leaving Low in his wake as he charged to goal but blasted over from 15 yards out. 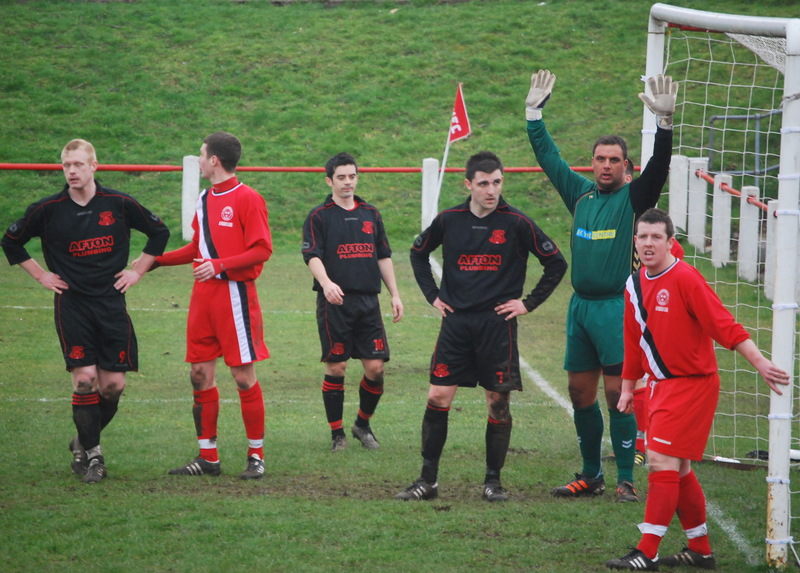 The home side rallied briefly but struggled to create any openings that would deliver an equaliser. With ten minutes to go the visitors brought on the fresh legs of John Dempster, to replace goal hero Armstrong, and within a minute he and Campbell beat the offside trap but the latter’s shot from the corner of the box went wide of target. 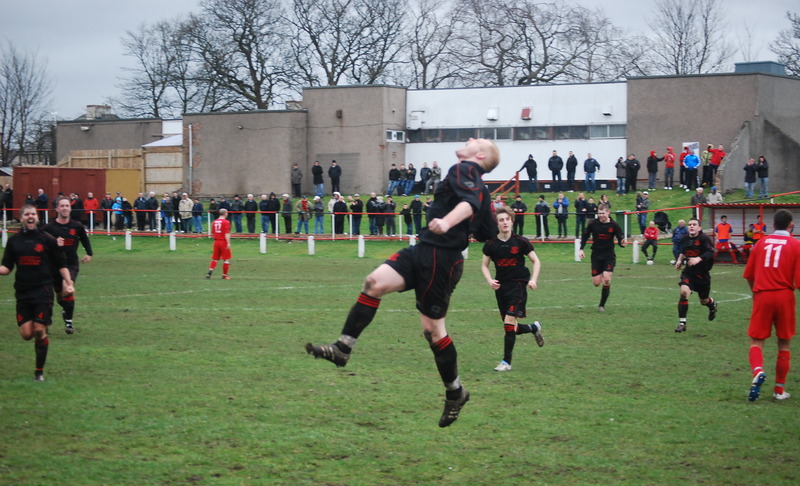 A minute later Thorniewood were pruned to 10 men when substitute David Campbell earned a second yellow card for clumsily chopping down McKenzie, and hopes of the home side salvaging a point appeared to have with withered on the vine. However, Thorniewood reacted well to the loss and on 86 minutes a good run and cross down the left by Mark Daly was rewarded with a corner kick. Scott Murphy whipped a wicked ball across the face of the goal eluding the jump of Semple and Chris Faulds was on hand to head home from a yard out. This entry was posted in GAFC Match Report and tagged Glenafton Athletic, New Cumnock, Scottish Junior Football, Thorniewood United. Bookmark the permalink.